Competition: Send us your best #sgullibselfie! Send us your best #sgullibselfie for a chance to win great prizes! The photos will be reused by St George’s Library, please make sure to only include yourself in the photo, or obtain the consent of any other people visible in the image. 1. The competition will run from Tuesday 29 August 2017 until Friday 13 October 2017. 2. The prize draw is open to St George’s, University of London and Faculty of Health, Social Care and Education (Kingston University and St George’s, University of London partnership) students only. 3. Entry to the prize draw is restricted to one entry per student. 4. Multiple entries will be disqualified. 5. Winners will be chosen at random from all valid entries once the competition has closed on Friday 13 October 2017. 6. Winners will be contacted via Instagram or Twitter. Be sure to check your account. 7. The prize can only be collected in person from St George’s Library on production of a valid St George’s University ID card. 8. Prizes must be collected within two weeks of notification. 9. The Judges’ decision is final and no correspondence will be entered in to. 10. Photos of the prize winners will be taken to be used in publicity on Library media channels. 11. One prize draw will take place, unless the prize(s) are not collected by the deadline, in which case uncollected prizes will be redrawn (once only). The following Terms and Conditions relate to the Spot the Bull competitions run during Freshers Fayre 2017. The competition will run 10am-2pm during the Postgraduate Freshers’ Fayre on Tuesday 29 Aug 2017 and the Undergraduate Freshers’ Fayre on Monday 25 Sept 2017. There will be no redraws if prizes are not collected. As 2016 draws to an end, we bring to you the highlights for St George’s Library. This year, the Library supported St George’s Students’ Union’s Raising and Giving Week by donating fines for a day and raised £137.45. The supported charities were Equip Africa, MACS and St George’s Hospital Charity. We’ve been continuing with our App Swap events. where staff and students get to talk about the apps that they have used, or have been involved with. Response has been great from student and staff who have attended, include Learning Advocate Ele Clancey. We aim to run more next year. June was the month for peace and relaxation in the Library, not least because it saw the St George’s Staff Development team launch its first “10 Days of Wellbeing” programme. We supported the new initiative by putting out a book swap trolley in the library foyer, where students and staff were encouraged to pick up or drop off books to share with others. We also added a selection of Mood-Boosting Books to the library collection. To date, the most popular title of the Library’s 2016 Mood-Boosting collection is The President’s Hat by Antoine Laurain. Regular library users might have noticed a few changes to the look of the library, especially the main Quiet Study Group area; this year we replaced all our chairs, brought in round tables, and then brought back rectangular tables due to student demand. We also added screens to create a more flexible study space and help reduce noise. We’re always looking for ways that we can make the space work better for all our users and are open to feedback – let us know if you have any thoughts by speaking to staff or filling in a feedback form at the Library helpdesk. In response to student feedback and after running some successful trials, this July we were pleased to announce that during the 2016/17 academic year we would once again be offering extended opening hours. We’re now open longer than ever before; offering 24 hour access to the Library from 8am on Monday mornings to 9pm Saturday evenings and 9am-9pm on Sundays. The start of the new academic year is always very busy for library staff and this September/October was no different as we welcomed all our new undergraduate and postgraduate students – we hope you are all now well settled in to life at St George’s! Alongside our busy programme of induction sessions, we ran a Treasure Hunt featuring a number of clues and activities to help new students find their way around the Library and its resources. Thank you to everyone who took part in our Social Media competition by liking our Facebook page and following us on Twitter. Our lucky prize draw winners went away with Honest Burger vouchers, Blossom tote bags and a St George’s teddy among other prizes. We also gave away a £20 Amazon voucher in our Treasure Hunt prize draw. Best of all, everyone who took part in the Social Media Competition can now get useful Library updates straight to their Twitter and Facebook feeds! In September we introduced a book display to showcase various resources that we think you will find helpful. Previous displays included our best books on study skills, and online resources recommended by the Learning Advocates. Come and take a look to see what delights we have in store for the New Year! You’ll find the display near the Library Helpdesk. On 18th November we raised £100 for BBC Children in Need’s annual fundraiser by raising money through our staff sweepstake and donating fines. Pudsey was spotted all over the library waving hello. In November we also participated in and celebrated Explore Your Archive week, a campaign organised by the UK National Archives and the Archives and Records Association. We ran two handling sessions where selected objects were taken from the archives and displayed. The history of each object was shared by the archivist Elisabeth. It was enlightening to find out more about our history and wonderful to share in the positive reactions and interest from staff and students at St George’s who attended. The sessions were supported by a series of daily hashtags showcasing photos from our archives. We loved taking part in Explore Your Archives and learnt more about the fascinating history of St George’s’. We end our blog with an original photograph from the archives showing St George’s Hospital at Hyde Park Corner at Christmas time in the mid-20th century. In 2017 we are looking forward to working with all our users and the Students Union to continue to improve the study environment for everyone. Follow us on Twitter or Facebook to win fab prizes! Between now and 14th October, we are running a Social Media prize draw with wonderful prizes to give away! The Library uses Twitter and Facebook to give you the latest information about Library services, as well as drawing your attention to relevant news items and articles relevant to the medical and health field. 1. The competition will run from Tuesday 30 August 2016 until Friday 14 October 2016. 3. Entry to the prize draw is restricted to one entry per student for liking the SGUL Library Facebook Page, and one entry per student for following @sgullibrary on Twitter. 5. Winners will be chosen at random from all valid entries once the competition has closed on Friday 14th October 2016. 6. Winners will be contacted via Facebook or Twitter. Please be sure to check your account. 10. Photos of the prize winners will be taken to be used in publicity on Library social media channels. The following Terms and Conditions relate to the Spot the Bull competitions run during Freshers Fayre 2016. The competition will run 10am-2pm during the Postgraduate Freshers’ Fayre on Tuesday 30 Aug 2016 and the Undergraduate Freshers’ Fayre on Monday 19 Sept 2016. As 2015 draws to an end, we bring to you the highlights of this year for St George’s Library. This year we started running App Swap events. These are events where St George’s staff and students come together to share useful apps that are on the market as well as apps that have been created by staff and students themselves. Feedback for the events have been great, and we aim to run more in 2016. Students who attended found it very useful, and we already have Assignment Surgeries planned for March 2016. Library staff dressed in red for Red Nose Day, and we donated all Library fines paid on that day and the following Monday raising £232.62 for Comic Relief. In April the IT team installed all new PCs in the computer rooms. Then in August the main computer room was refurbished and we now have an extra bank of 10 PCs installed for you to use. Our freshers fayre competitions featured more prizes than ever this year – from our Blossom Tote Bags to delicious meals from Honest Burgers and ace stationary from the lovely people at K and K Stationers. And of course more prizes meant more winners – it took a little time, but all prizes have now been collected. Congratulations again to all the lucky winners, and thank you to everyone who took part! Made available to St George’s NHS Trust staff this year, DynaMed Plus an evidence-based knowledge system that helps clinicians make the right decisions at the point of care. New resources for 2015 that are available to all St George’s staff and students include: Acland’s Video Atlas of Human Anatomy, ASSIA (Applied Social Sciences Index and Abstracts), and the Mark Allen Healthcare Collection of Journals (which contains titles such as the Journal of Paramedic Practice and the British Journal of Nursing) available via SFX. Other new journals include Nature Methods and Nature Biotechnology. See our full list of new purchases for 2015. Online resources can be accessed from our Databases list and Journals A-Z page. Friday 13th may be unlucky for some, but not it seems for Pudsey this November, thanks to Library users donating their outstanding fines and Library staff contributing to a staff sweepstake we raised £162.50 for the 2015 Children in Need appeal. Full opening hours details available. While some things are winding down as the end of the year approaches, we are still busy busy busy this December. We were happy to take part in St George’s Research Day to highlight the specialist services that we offer to support Researchers here at St George’s, in particular the work we do to support Open Access and Research Data Management. We are busy reviewing all the feedback we have received through the Library Survey we ran in November. Thank you to everyone who took the time to give us their views and help improve the Library service. One of our Library Christmas traditions is to support a charity in place of exchanging staff Christmas cards – this year we are donating to My Body Back a charity that Beth Jackson, currently our NHS Liaison Support Librarian, volunteers with. Find out how St George’s has also been involved in supporting their work in Beth’s blog post about their work. We end our post with a photo of the lovely cake that Library staff member Louise made. We will be running our 3rd App Swap event in December. This is a chance for staff and students to come together in an informal setting to share useful apps. All staff and students at St George’s and St George’s Trust staff who want to share or learn about apps. What kind of apps will be shared? This depends on what attendees bring on the day. Previous apps that have been shared include: AIM, Anatomy 4D, RevisePsych, MedEdEthics, Forest: Stay Focused, The Genetics Counselling App, ManchEWS. Read our App Swap round up blog posts for more details. Do I need to prepare a presentation? 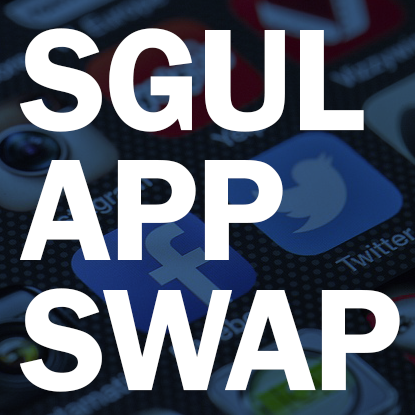 No, the App Swap event is quite informal; just let us know what you think about the app you’ve chosen, and be prepared to show us it on your device. To sign up for the event please send an e-mail to kpang@sgul.ac.uk with the subject heading App Swap event. If you already have an app in mind, please mention the app. We have a limit of 14 places. Yes! Tea, coffee and water will be provided, as well as some snacks. As well as the App Swap event, St George’s is also running a competition to get you thinking about the best way to use technology to support your learning. Tell us the best apps for lectures, small groups, practicals and revision and you could win some great prizes, including Red Letter Day experiences and Pebble Time watches. Between now and 11th October, we are running a Social Media prize draw with lots of wonderful prizes to give away. To enter the draw: follow @sgullibrary on Twitter or like our SGUL Library Facebook page. Double your chances of winning by doing both. The Library uses Facebook and Twitter to give you the latest information about Library services, as well as drawing your attention to relevant news items and articles relevant to the medical and health field. 1. The competition will run from Tuesday 1 Sept 2015 until Sunday 11 Oct 2015. 5. Winners will be chosen at random from all valid entries once the competition has closed on Sunday 11th Oct 2015.